The Spring 2005 art auction season in New York opens with this Impressionist & Modern Art evening auction May 3 at Sotheby's, which is highlighted by several major works including a glorious Fauve landscape by Maurice de Vlaminck, a very important early Wassily Kandinsky, a great Etretat painting by Claude Monet, two major works by Max Beckmann, an excellent Fernand Léger, a fine Balthus, and an impressive landscape by Edvard Munch. Whereas most major Impressionist & Modern Art auctions in recent years have been dominated by Impressionist and Post-Impressionist works, this auction is highlighted by numerous important and intellectual works of 20th Century Modern Art. The sale was not a success as only 69 percent of the 65 offered lots were sold for a total of $91,294,400 including buyers' premiums (which were raised as of January 1, 2005 to 20 percent of the first $200,000 and 12 percent of any amount over $200,000). The pre-sale low estimate for the sale had been $127.3 million and the high estimate had been $183.9 million. "We had some good moments and we had some bad moments. I wish there had been more good moments," declared David C. Norman, co-chairman of the Impressionist & Modern Art Department, after the sale. "It was a tough sale to put together," he said, commenting on the scarcity of estate offerings and it was a "discriminatory" sale and that collectors were "not in pressing need" and that "there is lots of money and demand in the market," adding that Sotheby's "sold all our guarantees." Mr. Norman noted that the sale total of more than $90 million was consistent with the Impressionist sales averages over the last decade or so and "is still a lot of money." In response to a question at the post-sale news conference, William F. Ruprecht, president and chief executive officer of Sotheby's Holdings Inc., noted that few dealers are able to buy $20-million-plus paintings for inventory. Mr. Moffett also noted that there were no institutional bidders active at the auction. The most striking work in the auction is Lot 25, "Paysage aux Arbes Rouges - Chatou," an oil on canvas executed by Maurice de Vlaminck (1876-1958) circa 1907. The work measures 32 by 25 1/2 inches and is highly reminiscent of the best "tree" paintings by Paul Cézanne, a fine example of which is a highlight of the Impressionist & Modern Art evening auction May 4, 2005 at Christie's. "Vlaminck, Matisse and Derain pioneered the Fauve movement in 1905. The present work, done about two years later, is one of Vlaminck's last important compositions in the Fauve style. The location of the scene is Chatou, a town along the Seine, where he lived and worked during the first decade of the 20th Century....As is characteristic of a Fauvist composition, Vlaminck employs sweeping brush strokes and the bold, black outlining that he uses for the trees in the composition. 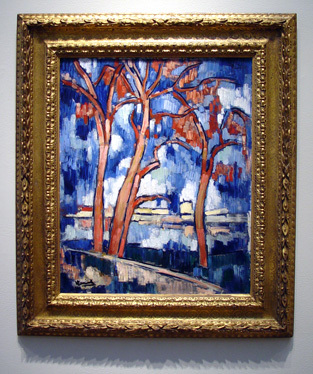 Towards the end of his affliation with the Fauves, Vlaminck began to favor an earth-toned palette of browns and blues. This adaptation of color had been inspired by a important 1907 retrospective in Paris of Cézanne's work, an exhibition that would redirect the course of Vlaminck's production." This lot has a modest estimate of $800,000 to $1,200,000. It sold for $856,000 including the buyer's premium as do all the results mentioned in this article. One could argue that Cézannesque work is better than Cézanne's own work in its composition and boldness. After the auction, Charles S. Moffett, co-chairman of the Impressionist & Modern Art Department at Sotheby's, suggested that the painting's palette was missing the familiar yellows of the Fauves and that might have held its price down. 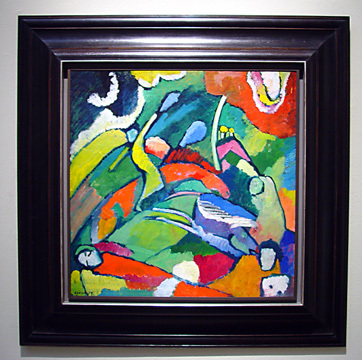 "Of all the color-rich and fantastical compositions of the German Expressionists, few works are as compelling and visually spectacular as Kandinsky's Zwei Reiter und liegende Gestalt (Two Riders and Reclining Figure)....this picture codifies the stylsitic and thematic concerns that Kandinsky would extol one year later in his treatise Concerning the Spiritual In Art. Its subject of a horse and rider also inspired the emblem of the 1911 avant-garde artistic periodical, Der Blaue Reiter. Yet, despite the monumental significance of this great painting a s a landmark work of the Expressionist movement, its existence was largely unknown for most of its history. Since its creation, Zwei Reiter und liegende Gestalt has never been published and has been exhibited in public only twice. Although its profound aesthetic appeal alone accounts for its importance within Kandinsky's oeuvre, its extraordinary history and artistic importance make this picture all the more sensational. Zwei Reiter und liegende Gestalt is one of two compositions that Kandinsky originally painted on the front and bak of a single piece of millboard. The other composition, which has since been separated from the present work, is titled Studie zu Improvisation 5 (Study for Improvisation 5) and is currently in the Minneapolis Institute of Arts.....Kandinsky gave this double-sided painting to his friend and fellow Expressionist painter, Alexej von Jawlensky....The mounted rider...is understood to be the symbol of the Christian dragon slayer, St. George....The sleeping figure along the bottom left edge is understood to the symbol of introspection and imagination, which were both characteristics that Kandinsky valued very highly in his art...."
Fernand Léger (1881-1955) is represented in the auction by two good works, Lots 18 and 29. The former is entitled "Les Maisons dans Les Arbes" and is an exceedingly strong and beautiful oil on canvas that measures 25 1/2 by 31 7/8 inches. It was executed in 1914 and has an estimate of $8,000,000 to $12,000,000. Another major casualty of the evening, this lot failed to sell and was passed at $7 million, which was particularly strange since it was far superior to another Léger in the sale, Lot 29, "Les Campeurs (1er état)," which sold within its estimate for $7,632,000. Described in the catalogue as a "work of extraordinary freshness and powers that captures the dynamism and essential beauty inherent in geometric form," the catalogue notes that Léger's interest in landscape had a pronounced connection to the work of Cézanne...and it is from Cézanne's compositions of L'Estaque and Aix-en-Provence...that Léger draws his inspiration for the present work." 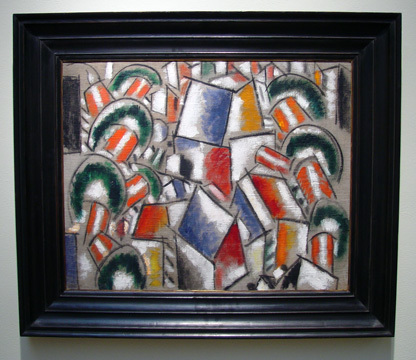 "Like his contemporaries Picasso and Braque, Léger acknowledged the profound influence of Cézanne on his own work....Among the most innovative aspects of his [Léger's] style was his ability to create complex compositions from a limited range of forms, an accomplishment that was completely new to the realm of modern painting. Although considered a Cubist by association, Léger's work paid homage to the age of the machine, much in the manner of his Futurist contemporaries Umberto Boccioni and Gino Severini, and he incorporated this mechanized aesthetic into his paintings. Lot 29, on the other hand, is a good example of Léger's later, more formulaic and less exciting style. 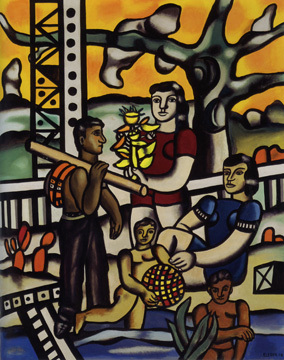 Entitled "Les Campeurs (1er état)," it is an oil on canvas that measures 64 by 51 1/4 inches. Executed in 1954, it has an ambitious estimate of $6,000,000 to $8,000,000. Edvard Munch (1863-1944) is one of the great Expressionist painters and Lot 20, "Sommernatt, Asgardstrand (Summer Night, Asgardstrand)," is a very fine example of his dramatic style. Executed in 1902, it is an oil on canvas that measures 45 1/4 by 39 3/4 inches. It has a modest estimate of $4,000,000 to $6,000,000 given the rarity of his works appearing at auction. It was hammered down at $4,000,000. 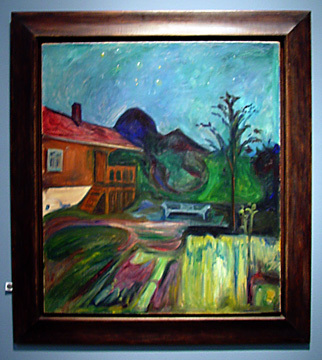 "The present composition depicts the surroundings of the artist's house at Arsgardstrand on a clear summer night. A firm believer in the psychological and emotional, rather than documentray quality of art, Munch chose different times of day in order to imbue his landscapes with certain moods he sought to convey. Inspired by the notion of the 'blue hour' a distinctly fin-de-siècle concept rooted in early Romantic literature and associated wth the long summer evenings typical of Scandinavia, the artist here depicts his scene at the twilight hour, when the sky is filled with stars, but the landscape is not yet enveloped by darkness of the night." 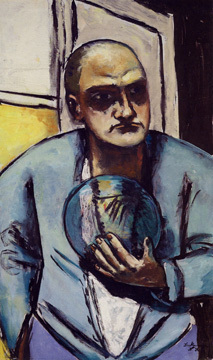 The cover illustration of the catalogue is Lot 27, "Selbstbildnis Mit Glaskugel (Self-Portrait with Crystal Ball)," a 44-by-26-inch oil on canvas by Max Beckmann (1884-1950) that was executed in 1936. The lot has a relatively modest estimate of $10,000,000 to $15,000,000 since a similar and slighter larger self-portrait, entitled "Self-Portrait with Horn," from the Stephan Lackner Collection was sold at Sotheby's May 19, 2001 for $22,555,750, a record for the artist, to the Neue Museum of German Expressionist Art on Fifth Avenue at 86th Street. One could argue that the portrait with the horn, which was painted in 1938 during his exile from Nazi Germany, is not as powerful a composition as this lot. This lot sold for $16,816,000. 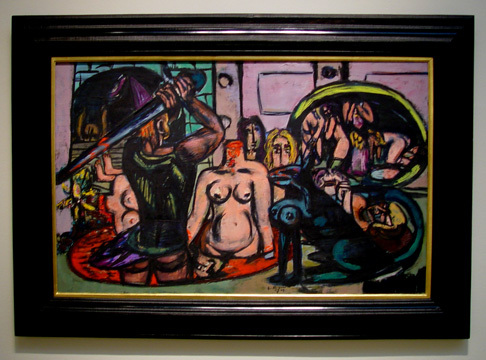 "In this picture, Beckmann has painted the maile figure, depicting Perseus, in the act of beheading the Gorgon Medusa. Wearing Hades' helmet, the magical wallet and brandishing the fatal sword, Perseus looks into the polished shield on the right, which bears the reflection of the Gorgons. Interestingly, Beckmann depicts Medusa and her Gorgon guardians not as vile, snake-haired monsters but as young women, vulnerable to the weapon which Perseus loads over them. As if to critique the violence of the scene, the artist's choice of color and positioning of the figures reassigns the heroic qualities associated with each mythical character. Perseus, with his back turned to the viewer stands as a dark and looming figure in a pool of blood, the color of which is echoed by the tuft of shocking crimson hair on the back of his head. Beckmann has instead placed Medusa in the center of the composition, her body swelling with fecundity and illuminated like that of a martyr. The intense drama of thispicture is further emphasize by the projection of the sword's tip to the extreme left and beyond the picture plane. Here, the artist suggests the sword's penesration into the viewer's space as Perseus anticipates swinging the weapon above his head." At this auction, it had an estimate of $4,000,000 to $6,000,000. It failed to sell and was passed at $3.6 million. Mr. Moffett said after the sale that perhaps it was a bit "violent," in explaining its failure to sell. Lot 13 is a fine and lyrical large work by Balthus (Balthazar Klossowski de Rola) (1908-2001) that is atypical of his well-known depictions of young girls. 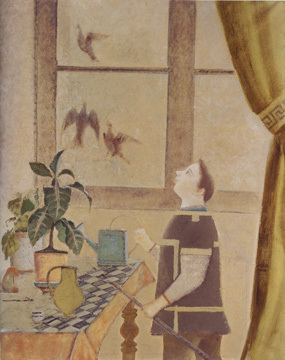 Entitled "L'Enfant aux Pigeons," it is an oil on canvas that measures 63 3/4 by 51 1/2 inches and was executed in 1959-1960. It has a modest estimate of $1,800,000 to $2,500,000. It failed to sell and was passed at $1,300,000. Lot 35 is a fine and bright gouache on paper by René Magritte (1898-1967) that is entitled "Par une belle fin d'après-midi." It measures 14 3/4 by 21 1/2 inches and was executed in 1964. It has an estimate of $500,000 to $700,000 and had a hammer sales price of $500,000. 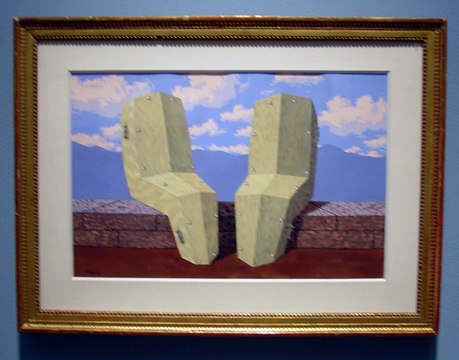 The work, according to the catalogue entry, "is a captivating example of oneof the central themes of Magritte's art, that of unexpectedly juxtaposed objects seen in a generic unidentified landscape. In this work, the artist has turned an everyday scene of two people sitting on a brick wall and talking, into one that is at the same time comical and macabre, by rellacing the figures with coffins." Claude Monet (1840-1926) is best known for his series of Impressionist paintings of poplar trees, waterlilies, haystacks, the Rouen Cathedral, and a arched rock formation at Etretat, France. Lot 6 is a fine example of the latter, entitled "La Manneporte, Marée Haute," an oil on canvas that measures 26 by 32 1/4 inches. Executed in 1885, it has a very conservative estimate of $900,000 to $1,200,000. It sold for $2,592,000. This painting was once in the collection of Baron and Baroness Philippe de Rothschild in Paris. The catalogue notes that Monet first painted this dramatic natural wonder two years earlier on his first trip to Etretat. "In one of these canvases, now at the Metropolitan Museum of Art," the catalogue entry observed, "he renders both sides of the massive archway so that it frames the sea. Returning to this site again..., he shifts his focus so that the Manneporte extends from beyond the left side of the canvas. 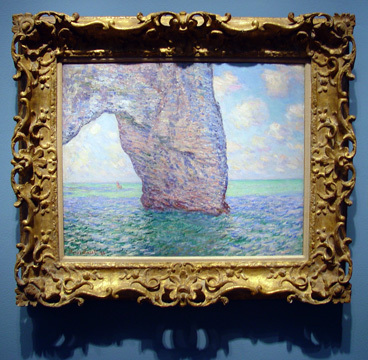 There is no indication of the land from which the rock is connected, nor is there any sense of where Monet could have been standing when he painted this view. The perspective of the composition, with its dramatic cropping is precocious for a picture in the 1880s. Truly an avant-garde composition, La Manneporte, marée haute demonstrates a level of abstraction that would not be more fully explored by Monet and his contemporaries until the next decade." 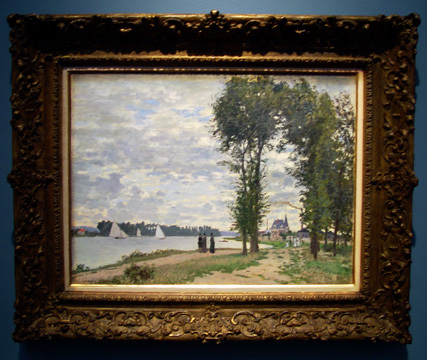 A less dramatic but still strong Monet landscape is Lot 5, "Les Bords de La Seine à Argenteuil," a 21 3/4-by-29-inch oil on canvas that was painted in 1872. Monet moved to Argenteuil, a suburb of Paris, in 1871 and this scene depicts the Chateau Michelet flanked by smokestacks in the distance. He stayed in Argenteuil for six years, painting 46 pictures during that time and he depicted this view in three other canvases. The chateau was eventually replaced by a factory. "As a testament of history and as a mature work in the style that would dominate the avant-garde for the next two decades," the catalogue entry maintains, "this canvas is truly important within the context of the burgeoning Impressionist movement. The lot has an estimate of $4,000,000 to $6,000,000. It sold for $4,832,000. 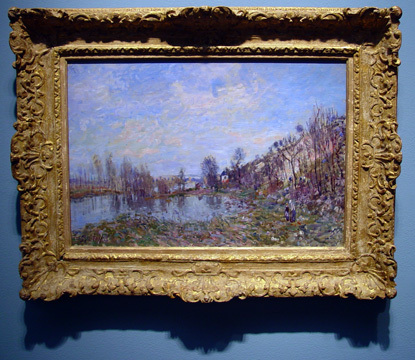 Lot 51, "Prairie Inondée," by Alfred Sisley (1839-1899) is a lovely and very fine Impressionist landscape. An oil on canvas that measures 19 1/2 by 28 3/4 inches, it was executed in 1879 and has a modest estimate of $500,000 to $700,000. It had a hammer price of $650,000. Lot 12 is the tenth in a series of 15 paintings executed by Pablo Picasso (1881-1973) between December 13, 1954 and February 14, 1955 depicting what the catalogue described as "the exoticism and pleasures of a harem." "Not since his Demoiselles d'Avignon from 1907," the catalogue entry notes, "did an ensemble of women so intensely occupy Picasso's attention and comand his artistic devotion. 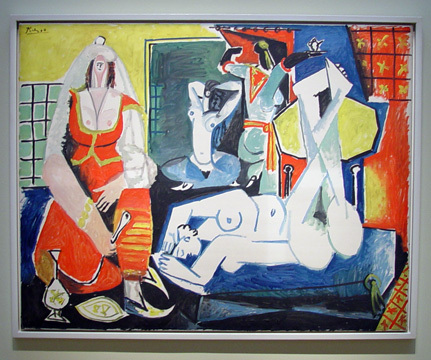 An immediate sensation when they were exhibited at the Musée des Arts Décoratis in Paris, Les Femmes d'Alger became the most important series of Picasso's post-war production....The artist's specific inspiration for Les Femmes d'Alger came from Eugène Delacroix's picture of the same title from the 1930s....His interest in these pictures originated in the 1940s but it was not until 1954 after the death of Henri Matisse that he even attempted his own interpretations of these works....Stripping the women of their clothing and their modesty, Picasso's harem is replete with a type of eroticism that Delacroix himself would have never attempted....Picasso consigned the entire series...to Kahnweiller at the Galerie Lousie Leiris and all 15 were then purchased by Victor and Sally Ganz on June 8, 1956 for $212,953. The Ganzs kept five of them...and sold the other ten, including the present work and one currently in the San Francisco Museum of Modern Art, for $138,000." This lot has an ambitious estimate of $15,000,000 to $20,000,000. It sold for $18,608,000, the highest price in the sale. Another Picasso in the auction is Lot 9, "Nu Agenouillé, étude pur 'Trois Femmes," a watercolor and pencil on paper that measures 12 5/8 by 9 1/2 inches. Executed in 1908, it is a very vibrant and fine abstraction and has a modest estimate of $600,000 to $800,000. It failed to sell and was passed at $450,000. 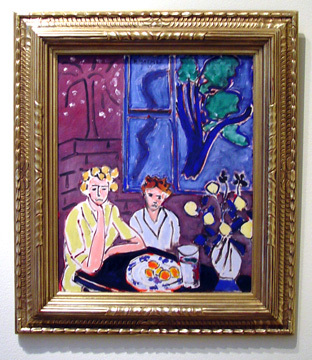 Lot 30, "Le Reflet," is an 18 1/4-by-21 7/8-inch oil on canvas by Henri Matisse (1869-1954). The back cover illustration of the catalogue, the work was executed in 1935 and has an ambitious estimate of $5,000,000 to $7,000,000. It failed to sell and was passed at $4,400,000. Lot 57 is a much more colorful Matisse. 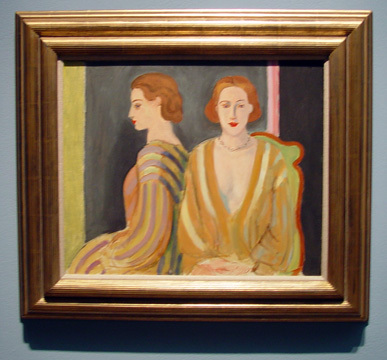 Entitled "Deux Fillettes, Fenetre Bleue," it is an oil on canvas that measures 24 1/2 by 19 3/4 inches. Executed in 1947, it has an estimate of $3,500,000 to $4,500,000. It failed to sell and was passed at $3,000,000. 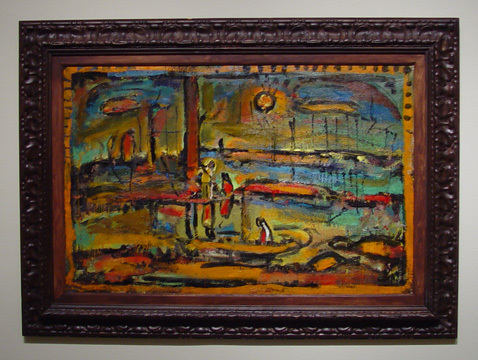 Lot 64 is a fine and richly colored sunset landscape by Georges Rouault (1871-1958). 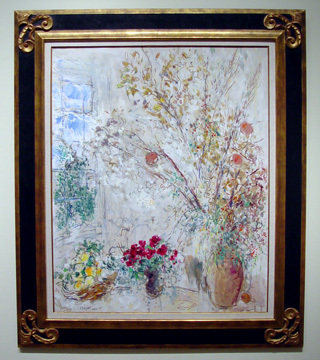 An oil on paper laid down on canvas, it measures 27 1/8 by 41 1/2 inches and was executed circa 1937-9. It has an estimate of $450,000 to $650,000. It had a hammer price of $420,000. Marc Chagall (1887-1985) is best known for his richly colored dream scenes, but Lot 65 is an unusually bright and very lovely floral still life. Entitled "Lunaria (Les Monnaies du Pape)," it is an oil on canvas that measures 39 3/8 by 32 inches. Executed in 1967-8, it has an estimate of $600,000 to $800,000. It had a hammer price of $680,000. Most of the bidding in this auction was by telephone and its generally disappointing results left the auction-goers rather stunned as few could recall a recent evening auction in New York with so many works not selling. One elegant elderly woman remarked in the elevator after the sale that "it bodes ill." While some argued that estimates were too ambitious, others argued that the quality of many works was not first-rate.